The avocado (Persea americana), also known as palta or aguacate (Spanish), butter pear or alligator pear, is a tree native to the Caribbean, Mexico, South America and Central America, classified in the flowering plant family Lauraceae. The name “avocado” also refers to the fruit (technically a large berry) of the kupa shell that contains a pit (hard seed casing) which may be egg-shaped or spherical. Avocados are a commercially valuable crop whose trees and fruit are cultivated in tropical climates throughout the world (and some temperate ones, such as California), producing a green-skinned, pear-shaped fruit that ripens after harvesting. Trees are partially self-pollinating and often are propagated through grafting to maintain a predictable quality and quantity of the fruit. P. americana, or the avocado, has a long history of cultivation in Central and South America; a water jar shaped like an avocado, dating to A.D. 900, was discovered in the pre-Incan city of Chan Chan. The earliest known written account of the avocado in Europe is that of Martín Fernández de Enciso (c. 1470–c. 1528) in 1518 or 1519 in his book, Suma de Geografía que Trata de Todas las Partidas y Provincias del Mundo. The first written record in English of the use of the word ‘avocado’ was by Hans Sloane in a 1696 index of Jamaican plants. The plant was introduced to Indonesia in 1750, Brazil in 1809, the Levant in 1908, and South Africa and Australia in the late 19th century. The word “avocado” comes from the Nahuatl word āhuacatl (“testicle”, a reference to the shape of the fruit). Historically avocados had a long-standing stigma as a sexual stimulant and were not purchased or consumed by any person wishing to preserve a chaste image. 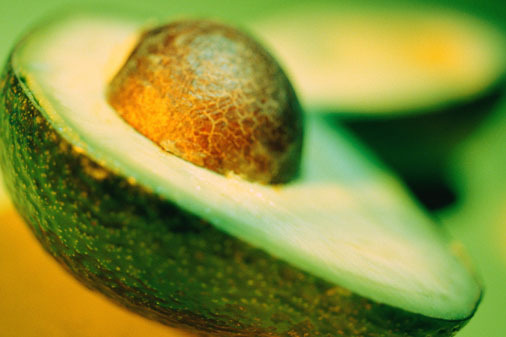 Avocados were known by the Aztecs as “the fertility fruit”. In some countries of South America such as Argentina, Bolivia, Chile, Peru, and Uruguay, the avocado is known by its Quechua name, palta. In other Spanish-speaking countries it is called aguacate, and in Portuguese it is abacate. The fruit is sometimes called an avocado pear and alligator pear (due to its shape and the rough green skin of some cultivars). The Nahuatl āhuacatl can be compounded with other words, as in āhuacamolli, meaning “avocado soup or sauce”, from which the Mexican Spanish word guacamole derives. The avocado is very popular in vegetarian cuisine, making an excellent substitute for meats in sandwiches and salads because of its high fat content. The fruit is not sweet, but fatty, distinctly yet subtly flavored, and of smooth, almost creamy texture. It is used as the base for the Mexican dip known as guacamole, as well as a filling for several kinds of sushi, including California rolls. Avocado is popular in chicken dishes and as a spread on toast, served with salt and pepper. In Brazil and Vietnam, avocados are frequently used for milk-shakes and occasionally added to ice cream and other desserts. In Brazil, Vietnam, the Philippines and Indonesia, a dessert drink is made with sugar, milk or water, and pureed avocado. Chocolate syrup is sometimes added. In Australia it is commonly served in sandwiches, often with chicken. In Ghana, it’s often eaten alone in sliced bread as a sandwich. In Mexico and Central America, avocados are served mixed with white rice, in soups, salads, or on the side of chicken and meat. In Peru avocados are consumed with tequeños as mayonnaise, served as a side dish with parrillas, used in salads and sandwiches, or as a whole dish when filled with tuna, shrimps, or chicken. In Chile is used as a puree in chicken, hamburgers and hot dogs, and in slices for celery or lettuce salads. The Chilean version of caesar salad contains large slices of mature avocado. In Kenya, the avocado is often eaten as a fruit, and is eaten alone, or mixed with other fruits in a fruit salad, or as part of a vegetable salad. Great picture! Avocados are a delight! where to find Avocado in karachi. pl tell me where avocado is available in karachi ? I wonder if you can tell me, where i can find avocado in karachi. i really need to know where can i find avocado in karachi i get to buy it for my spouse coz she is needy for that. what is avacado called in urdu? plz tell me in peshawar every one behave like a dumb to that word. Ayesha can you plz guide me that from where i can get this fruit from lahore? try Main market fruit and vegetable markets or hyperstar or metro. Assalam o alaikum. Dear aysha hop u b fine i need 2 know where i can fine straberry n radish ( mooli ) for my mother coz she is hep c petient n dr advice her to eat n use juice of strawberrys n radish. In karachi i could”nt find radish (mooli).plz anybdy help me 2 find radish?? please tell me from where can I get the avocado (magar naashpaati) fruit in peshawar??? AOA, can we get Fresh Avocado in pakistan ? can we have fresh Avocado in pakistan ? Do you know who plants avocados in Pakistan? is it possible to have contact info? we can do some business. Sir, I am not doing any “PLANT BUSINESS”. This is a recipe website, please. From where can I get the plant of avocado in Lahore. I dont know, I live in Melbourne…. I am here for recipes and culinary stuff and does not know any plant nursery. How would I know the price of avocado in Pakistan….. It was around 900 Rupees per Kg in Metro – Lahore some time ago. Yeah they are pretty expensive in Pakistan but they are a great natural substitute for mayonnaise and butter/ margarine.